I normally despise syrupy-sweet desserts but for some reason I decided earlier this week that I absolutely had to buy some “pumpkin jam” that was sitting at the checkout at my usual falafel spot/Middle Eastern grocery. I love every other pumpkin dessert I’ve tried, so why not? I asked the owner what it was and how you eat it. She said you just eat it as is and that it comes from her hometown. They’re having trouble getting it because of what’s going on in Syria right now, so she asked me to be sure to report back and tell her whether I liked it. I guess it’s telling that it took me five days to work up the nerve to try it. I started worrying because I realized I wouldn’t be able to go back to the store until I tried it. Well, last night I finally did. I took a small bite out of one piece, chewed for a bit and spit it out. My co-taster managed a whole piece, but mostly because he was brave enough (or stupid enough) to put a whole piece in his mouth all at once. 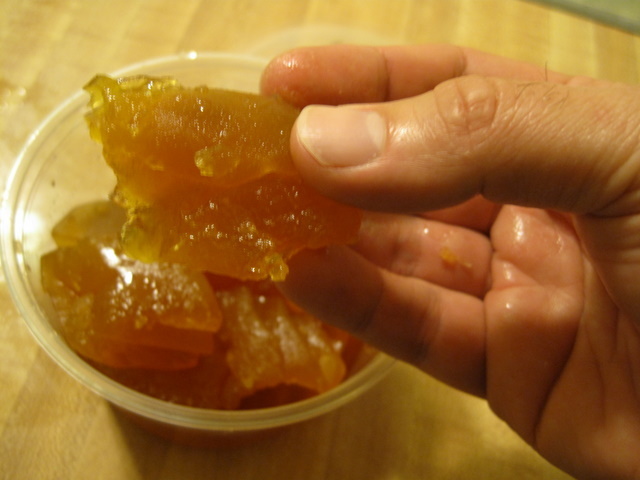 The jam is made with pickling lime (calcium hydroxide), which causes the pumpkin to retain much of its original crunch and stringiness. Thankfully I had read about the crunch in advance. I had also assumed that the syrup was a sugar syrup, but it tasted more like honey. At least, it had that funk that honey sometimes has, sour but not in a pleasant, citrusy way. In fact, pretty much all I tasted was sour funk. The good news is that I think I’ve found I have a birthday present for my brother-in-law. I am the co-taster and also the hand model. The piece you see me holding is the very one that, moments later, I naively popped into my mouth. It was a pretty big piece, is what I’m saying. 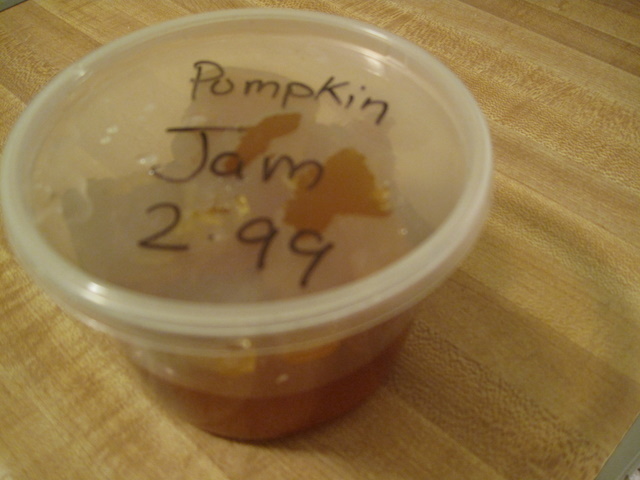 If I were to eat pumpkin jam again, the first thing I’d do differently would be to take a smaller piece. The second thing would be not to put it in my mouth. My mouth is puckering just looking at it. Yay, for trying it though. I’d just tell the woman you didn’t like it. I’m sure she’ll understand. I was afraid describing it as sour might be confusing. It’s not acidic at all. Just imagine honey-drenched baklava but worse. The brother-in-law likes it, so at least it’s not being thrown away. Do you mean like Thymian honey? I can’t stand that stuff. I’d describe the taste as almost metallic. I’ve only ever had thyme honey in dressing, so I’m not sure. I don’t think I’d describe this flavor as metallic though. Now that it has been a few days, I’m beginning to forget what it tasted like, which is a good thing!